Todd Garofano has been president of the Saratoga Convention & Tourism Bureau for eight years. 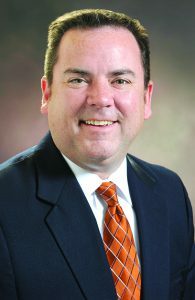 Todd Garofano, president of the Saratoga Convention & Tourism Bureau, is stepping down from the position in April. Garofano is leaving to pursue other interests outside of the industry. His last day will be Friday, April 6. A search committee was formed, led by Megan Hennessey, general manager of the Courtyard by Marriott and at-large Executive Committee member of the board of directors. The job description can be found at www.discoversaratoga.org/the-bureau/opportunities. Those interested in applying for this position should send a cover letter and resume to jobs@discoversaratoga.org. The bureau has requested no telephone calls. Over his eight years at the helm of Discover Saratoga sales have grown almost 125 percent with over 98,000 in contracted room nights signed in 2017 compared to just over 43,000 in 2010, according to the bureau, also known as Discover Saratoga. Discover Saratoga serviced over 640 groups in 2017, an increase of almost 280 percent from 2010 when they served just 167 groups, which accounted for nearly 100,000 room nights and $67.5 million in estimated economic impact, officials said. Discover Saratoga received national recognized honors with the 2013 and 2014 Pinnacle award from the Successful Meetings website and the 2012, 2015 and 2016 Gold Service award from Meetings & Conventions, a multi-platform brand for dedicated meeting and business event planners in corporations, associations and more. In 2015, Garofano successfully negotiated a management agreement contract with the City of Saratoga Springs for Discover Saratoga to take over the operations and programs for the Heritage Area Visitor Center. They quickly improved the exhibits and displays, added staff, expanded hours and offered additional programing. The team was rewarded with two consecutive (2016 and 2017) Trip Advisor Certificate of Excellence awards for outstanding service and had record attendance each year with 2017 topping out at over 40,000 visitors. Discover Saratoga will announce the 2017 Hometown Ambassadors and Volunteers of the Year at its 33rd annual meeting and breakfast 8-10 a.m. on Tuesday, March 13, at the Saratoga Springs City Center. Bureau members will have the opportunity to vote for board of directors and officer candidates during the meeting. Those nominated for their first three-year terms are: John Howard of the Gideon Putnam, Chris Perez of Live Nation and Elizabeth Sobol, CEO of SPAC. A.J. Bodden of Albany Broadcasting is slated to run for his second three-year term. The following candidates were nominated to serve their second one-year term as officers: Hollowood as chairperson, Tom Newkirk (Saratoga National Gold Club) as immediate past chairman, Bodden as chairman-elect, Marianne Barker (Impressions) as treasurer and Hennessey as the at-large officer. Tickets are $35 per person, or $280 for a table of eight. The event provides attendees with the opportunity to network with fellow members and community leaders over a buffet breakfast. The registration form and sponsorship information are available at www.DiscoverSaratoga.org/annual-meeting.